“Conscientious winegrowing should be unhindered by convention,” says the bold statement posted on the website of Paso Robles’ ONX Wines. Since its founding a little over a decade ago, ONX has learned to embrace that notion ever more enthusiastically. 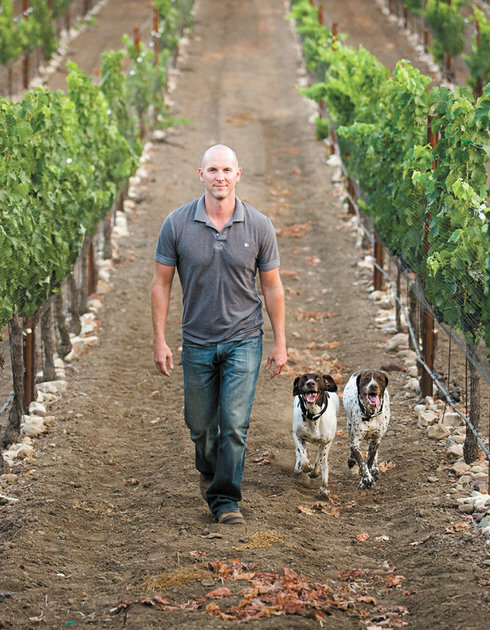 Brian Brown, ONX’s winemaker, has a long resume for a relatively young guy. After earning a degree in viticulture and enology from UC Davis and completing internships at Iron Horse Vineyards in Sonoma, Salitage in Pemberton, Australia, and Napa Wine Company in Oakville, Brown’s early career was spent in Napa at Trefethen, Vineyard 29 and Round Pond Estate Winery, where he honed his craft over seven vintages. But America’s premiere wine region began to feel restrictive. “I was getting a little restless. I was ready to try out some new ideas,” Brown said as we tasted his most recent portfolio in one of several intimate picnic/lounging areas (ONX calls them “embedded oases”) that dot ONX’s picturesque vineyards. In 2004, Brown was introduced to Steve Olson by a mutual friend. The Olson family, who founded one of the largest construction companies in Southern California, had just purchased the initial 59 acres of undulating former rangeland adjoining a small stream, Santa Rita Creek, near a tract of suburban homes southwest of Templeton. ONX (pronounced throughout the valley as “Onyx”) lies at the heart of the Templeton Gap, and it’s only nine miles from the coast as the crow flies. The temperature variation, in a word, is extreme. “There are some days during harvest where we have 30- to 40-degree diurnal swings,” Brown said. “The winds will start picking up some days at 10 a.m., because it’s so hot (on the east side of the valley) it pulls the marine air in. We are right in the barrel of the shotgun here.” The low-lying end of the property, near the stream, tends to draw cool air, which lingers – a perfect spot for Sauvignon Blanc. Brown’s pilot vineyard, planted in 2005, included the most common Rhône varietals: Syrah, Grenache and Mourvèdre. But after a weekend retreat with the Olson family, a different vision emerged for the young vineyard. Working on a hunch and his love of European wine beyond France, Brown planted several blocks with a mixture of Rhône, Spanish, Bordeaux, Portuguese and Italian grapes – 13 in all. ONX released its first experimental vintage in 2008; the winery has hit its stride in the last few years with major accolades and impressive scores from Wine Enthusiast, the San Francisco Chronicle and Stephen Tanzer. ONX’s wines triumphed at the 2015 San Francisco Chronicle Wine Competition, winning two gold medals and one double gold. The recent purchase of an adjoining 61 acres has doubled the vineyard’s size, and Brown plans to increase the number of varietals and clones. That suits the winemaker nicely. He’s still in a period of experimentation, and there’s plenty of room to grow – only 30 acres are under vine, and Brown estimates that could easily be doubled. It’s the price to be paid, Brown admits, when your goals are complexity and unusual synergy, two traits he prizes above all others.